While you can buy perfectly adequate complete skateboards from your local skateboard store or online, any serious skateboarder will want to customize every element of their skateboard setup. This guide will explain how you go about building a skateboard and cover the key components that you need. The deck is the part that you stand on and is nearly always made out of wood. In fact, it’s usually made out of multiple layers of wood that are glued together to give it the strength required to take a daily battering. The deck is the starting point of your skateboard setup, you’ll be attaching the other components to this, starting with the grip tape. Grip tape is essentially sandpaper for your skateboard. It ensures that you can stand on the skateboard without slipping off by providing an element of resistance. It also destroys your trainers! Grip tape comes with a sticky backing and is applied directly to the top of your skateboard before then being cut to size. Skateboard Trucks are the metal T-shaped items applied directly to your skateboard deck. They keep your wheels and bearings attached to the skateboard and come in a variety of different shapes and sizes. 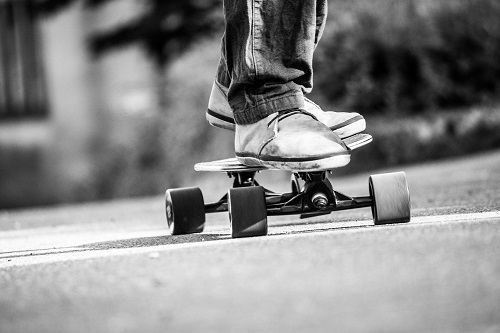 Trucks are attached to your skateboard using nuts and bolts, which are referred to as skateboard hardware. Trucks tend not to be supplied with skateboard hardware, so you will have to buy these separately. Ensure you attach one truck at a time, with each truck facing opposite the other. The Hanger (largest, flattest part of the truck) should face outwards at both the front (nose) and the back (tail) of the deck. Bearings sit within the skateboard wheels and allow them to rotate freely. They are crucial for providing a smooth ride. They usually require quite some force to install. However, be warned, you need to be extremely careful when installing them as you do not want to bend/dent or damage the bearing in any way as this will impact their operation. So just take your time and push them into the wheel slowly but firmly. You can get lots of different shapes, sizes, and designs of skateboard wheels. Skateboard wheels sit on the axle of your trucks. And you need 4 wheels, 2 per truck. Skateboard Wheels cannot be installed without bearings. Once bearings are installed within the wheel you can attach the wheels to the axle of the truck, and tighten the axle nut using your skate tool. Warning! If you over tighten the nut, you could damage the wheel bearing and stop the wheel from being able to rotate. So just take your time and ensure the wheel rotates freely. It’s quite normal for there to be a little bit of play in the wheel, so it may move up and down the axle slightly. I hope this guide was helpful in explaining the key elements of what’s required in order to build your own skateboard. It may seem a little daunting building your own skateboard for the first time, but once you get the hang of it you’ll probably never go back to buying a complete ready built skateboard ever again. This entry was posted in Land Sports, Skateboarding and tagged Skateboard, Skateboarding. Bookmark the permalink.